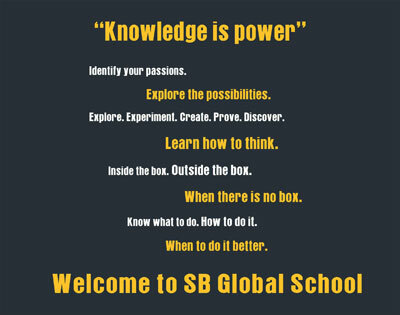 SB Global School is part of SB Group of Institutions established by the Chanderwati Educational and Charitable Trust. The Trust believes that it is the education & learning that can bring about the true transformation in society, making it both economically & socially better. This is the guiding spirit with which the Trust has established SBGS, to shape the young mind by giving knowledge of different subjects and fields. This knowledge makes a child perfect in the field of his choice for future life. One cannot achieve perfection without ample knowledge. The mind starts getting power with the input of knowledge in the student’s life period. This educational activity keeps on developing the mind towards the perfection an important part of personality. The student becomes powerful in respect of maximum use of his IQ. Once the IQ level is developed, it does not come down through the life of the student. He becomes a good and perfect citizen of the country. The motto of our school is to create an academic atmosphere in the school and develop the students all round personality mentally, socially and spiritually. This academic atmosphere provides chances for the students to make a good and perfect personality. Knowledge is an essential part of human life. Gaining and Creating knowledge are two important activities of any human being. Student’s life is a period of gaining knowledge and then the personality of these students starts creating knowledge in their respective fields. This knowledge becomes a real power of the students. Our motto is to develop it.